Do you want to know how to transfer data from Acer to iOS devices? If you have no idea on this issue, you can check out this tutorial to get some methods to solve the problem. Here I would like to list 4 of them for your reference. Email is always a traditional way to switch from Acer to iPhone. As for how to make it via Email, please follow me to read the steps shown below. 1. Connect Acer with computer via USB cable and then log into Gmail account on your computer. 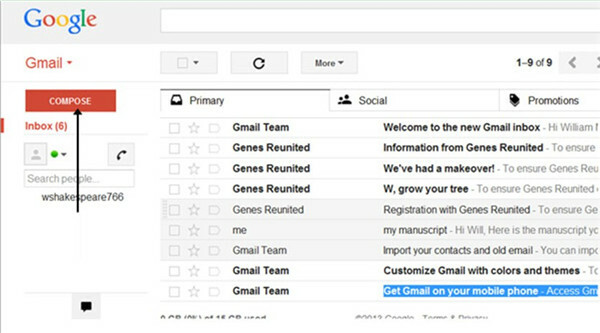 Click on the “COMPOSE” button at the upper left corner of the interface to create a new email. 2. After that, click on the paperclip icon at the bottom of the new email interface to browse your computer to find the files in your Acer storage folder that you desire to transfer to iPhone. 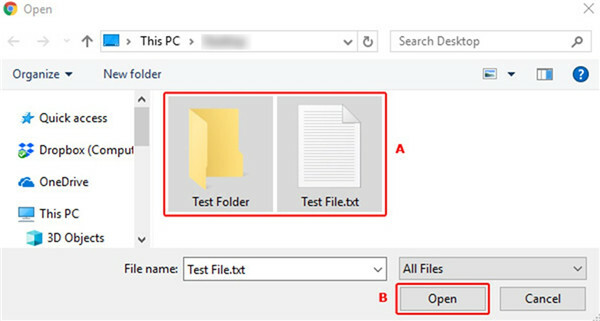 Choose files and then click on the “Open” button. 3. When you’ve successfully attached your Acer files, they will display at the bottom of the new email. After you fill in other info in the new message, you can click on the “Send” button to send it to another email account of yourself. 4. On your iPhone, you need to log into your email account to receive the new message and download the attached files to local folder. Thus, you can finish the process to transfer data from Acer to a new iPhone via Email. 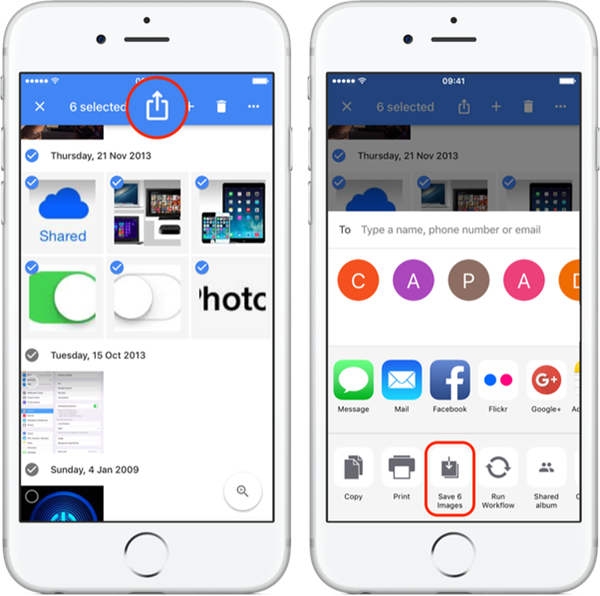 As the Email has limitations on file sizes, you can refer to other solutions to deal with how to transfer data from Acer to iOS devices when you want to transfer lots of files. Also, some types of files cannot be transferred via email, you could resort to other guides like how to transfer SMS from Acer to iPhone. 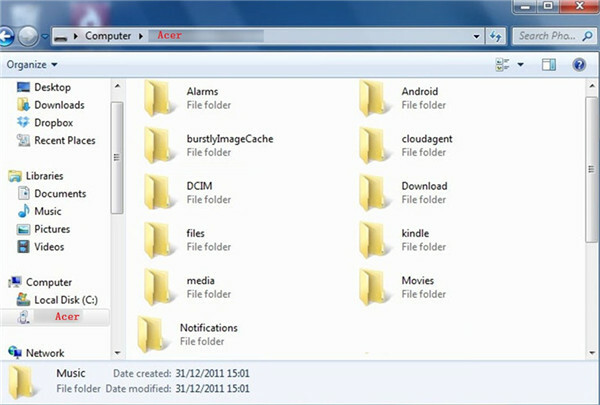 As for how to transfer files from Android to iPhone, you can combine Windows Explorer and iTunes to realize the goal. The following steps will help you to make it. Here I would like to take music files for example. 1. Plug Acer into computer via USB cable, and it will be detected as external hard drive by your computer. 2. Run iTunes on computer and make sure it is the latest version. Go to “Edit > Preferences > Devices”. In the panel, you need to tick “Prevent iPods, iPhones and iPads from syncing automatically” to begin to solve how to transfer data from Acer to a new iPhone. 3. Connect your iPhone with computer and then you will see your iPhone information in the interface. 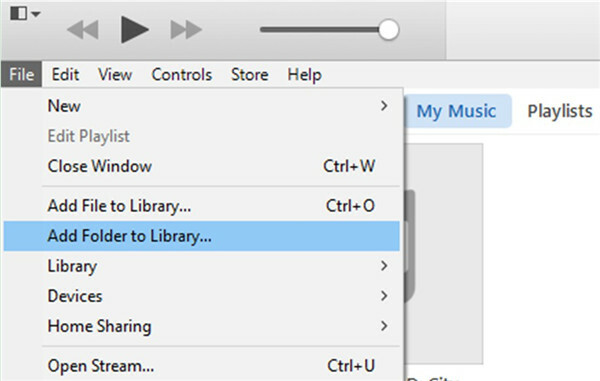 Navigate to “File > Add File to Library” or “File > Add Folder to Library” on iTunes window to select the music files on your Acer storage folder to add them to iTunes library. 4. Move to “iPhone icon> Settings > Summary > Music” tab. 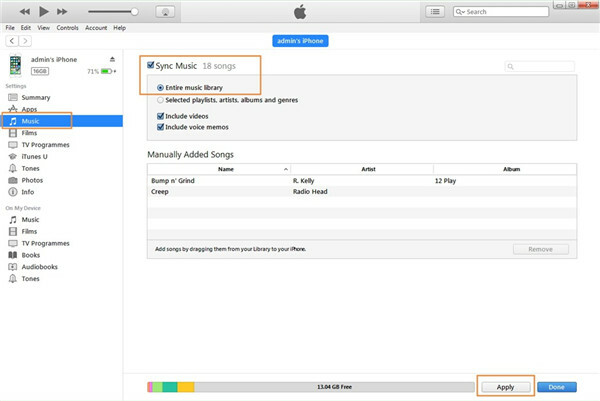 Check “Sync Music” in the right part of the iTunes interface. Tick the proper option under this tab and then click on “Apply” button at the bottom right of the iTunes interface. Wait for a moment, your Acer files will be available on iPhone. Like email, Windows Explorer cannot solve problems like how to transfer music from Acer to iPhone. But you could resort to Leawo iTransfer. If you just want to transfer photos and videos from Acer to iPhone, you can make use of Google Photos. This application can be used to share pictures and videos with family, friends, and other people conveniently. 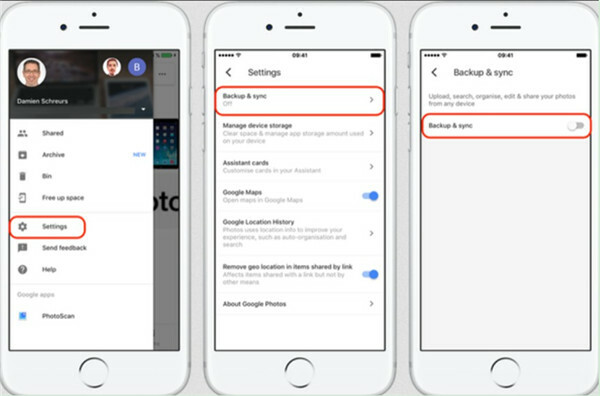 The detailed steps are shown below to display you how switch from Acer to iPhone via Google Photos. 1. 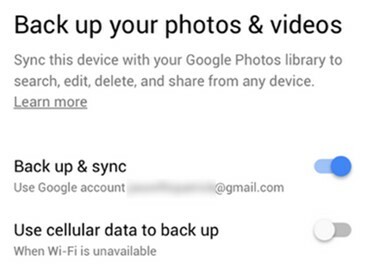 On your Acer, click to run Google Photos app and then sign into your Google account on it. At the top of the interface, click on the menu icon and then choose “Settings”. Turn on the option of “Back up & sync”. Make sure your Acer has been connected with Wi-Fi network. After a while, your Acer photos and videos will be in Google Photos app. 2. On your iPhone, open Google Photos app on home screen and then swipe upwards to connect iPhone with Wi-Fi network. Sign into the same account that you are using on Acer. Go to “Settings > Back up & sync” to enable this function. After a moment, the Acer photos and videos will be accessible on iPhone Ggoogle Photos app. 3. After that, choose your desired photos and videos synced from Acer that you want to download to iPhone local folder. Click on the share icon at the top of the page and then tap on the option of “Save x Images”. In the end, your Acer photos or videos will be available on iPhone folder. If you want to transfer data from Acer to iOS devices more completely, you can continue to look at the following contents to help you. If you want to switch from Acer to iPhone, Leawo iTransfer will be your good assistant tool. 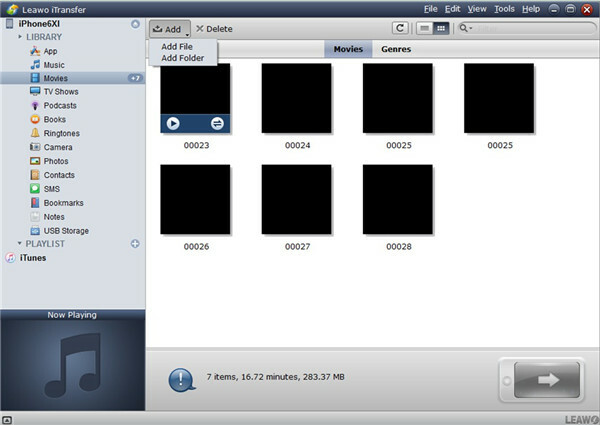 It enables users to manage 12 kinds of files among computers, iTunes and iOS devices, which is quite useful on solving how to switch from Acer to iPhone. You can also use it to transfer files from iPhone to Acer in case you need. Follow me to read the detailed steps on how to transfer files from Android to iPhone with iTransfer. 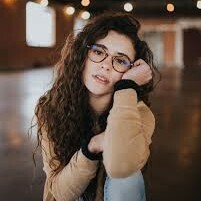 Here I would like to take movies for example. Connect your Acer and iPhone with computer with suitable USB cables. The computer will recognize Acer as an external hard drive. Launch iTransfer and the software will detect iPhone automatically. Go to “iPhone icon > LIBRARY > Movies” and then click on the “Add” button to go to your Acer folder to find the movie files. Click on “Open” and the transfer process will be ignited. If you want to transfer other files to iPhone, you just need to click on the corresponding category under the menu of “LIBRARY” and then click on the “Add” button to upload Acer files to iPhone. When the transfer process comes to an end, you will get the Acer files on your iPhone. iTransfer is the best choice for you to transfer files from Android to iPhone. Now you can have a try and you will know how great this software is.